If you presently or have any ancestors who lived any length of time in the states of New York or New Jersey, you are in luck. 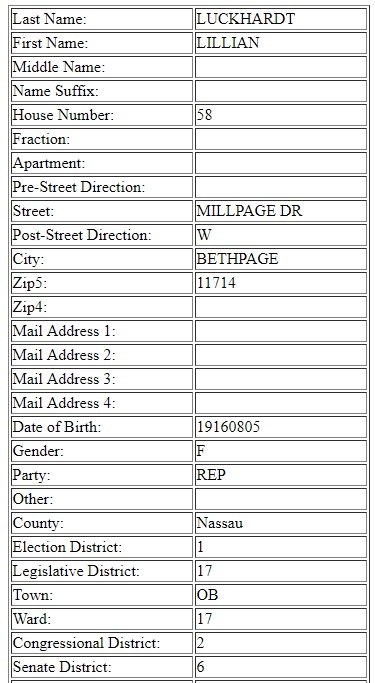 The website operated by Stephen Morse has added the voter rolls for residents of NY and NJ. What a treasure, because there is a good deal of information in these listings. 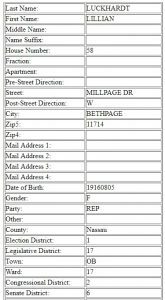 Besides the full name, a home address, the person’s full birth date and which political party they were part of along with their voting records dates. You would be surprised the number of individuals with the same surname in each state. Some examples: Briggs in NY had over 4,000 individuals and in NJ had 765 Briggs names. Looking over full listings of surnames, you can see those sharing the same house address, so here are family members in the same home. That could be a real bonus of information for your research. Click on any names of interest and the full listing of information is done up in a chart listing. There are listings for voters born in the late 1800s and early 20th century. In the listing for their name, it would say purged – reason death. So there could a wide range of ancestors to be discovered if they lived in New York or New Jersey. Even a famous individual can be located. Photos: Listing in New York for the Trump family and a N.Y. voting record for Lillian Luckhardt, born in 1916.